(Natural News) The thought of keeping your own bees in your homestead can be appealing, as well as a little daunting, what with the responsibility of tending to their every need to keep them thriving in your backyard. However, apiculture, or beekeeping, has some great benefits for you, your family, and the environment that may finally encourage you to consider it. Bees are actually essential to our food chain, though they may not look like it. Their pollination is estimated to be responsible for producing one-third of the food we eat worldwide. Without pollinators like bees, crop yields would decline and our supplies of food would diminish. In recent years, a phenomenon called Colony Collapse Disorder has been affecting bees worldwide. 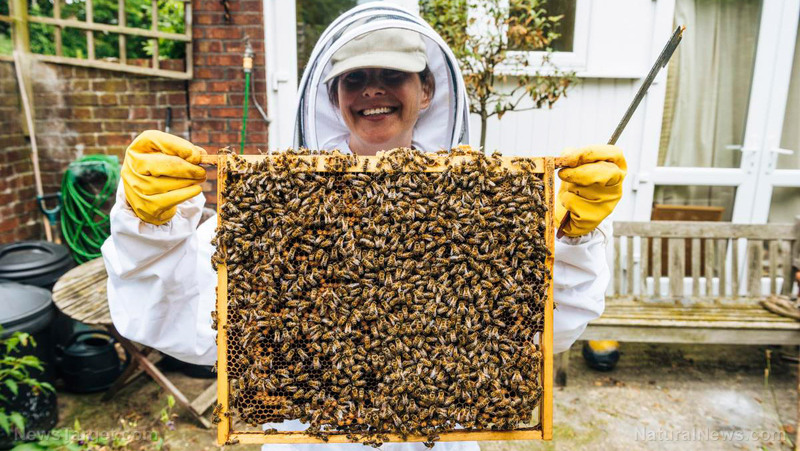 Seven species of bees have already been tagged as endangered in the U.S. only recently, but scientific endeavors have opened the doors to understanding the challenges these bees are facing, and raising awareness on their ordeal has made beekeeping quite popular. Beekeeping is not as difficult as you might think, especially today when there are easy and widespread access to hives, equipment and the bees themselves. Information is also widely accessed through the internet. As mentioned above, bees are essential pollinators. They have a mutual relationship with flowers – the bees help propagate the pollen and in turn they get the nectar from the flowers that sustains the colony. The older bees collect the nectar while the younger ones wait in the hive to convert the nectar into honey. This “you scratch my back, I scratch yours” relationship can stimulate your gardens to explode with colorful life all season long. The bees will forage and pollinate for three miles or more from the hive, which means the benefits of a single hive’s pollination can be felt far and wide. You can help them along by planting flowering plants that bloom all season long, known as “staggered blooming,” to ensure that the bees have the resources they need to produce an abundant amount of honey or “honey flow” across the seasons. NASA has a honeybee forage map that lists honeybee-friendly plants by region to give you a good start. Bees are also helpful with fruit production – if you grow apricots for instance, you may see a 50 percent increase in yield compared to apricots not visited by bees. You will need time, money, and hard work to keep and maintain your own bees, but at the end of it all, your efforts will be rewarded with sweet, delicious honey. This gooey substance has been dubbed by many as a miracle food because it never spoils – perfect edible honey has been found in fossil record from thousands of years ago. Honey is a natural food sweetener and a much healthier choice compared to the grocery store variety. You will also discover that the color and taste of honey varies from hive to hive – it is heavily dependent on the type of flowers from which the bees forage. Some honey are darker in color and have a stronger taste, while some are lighter and milder. The fun in keeping your own bees is in knowing that your honey is uniquely your own. Did you know that bees sometimes produce purple honey? It’s very rare and expensive, and nobody knows exactly why they are purple, but it tastes delicious just the same. Queen bees spend some time mating at the start of their life before settling down to lay thousands of eggs for the remainder of their days. Male bees are called drones and they don’t have a father, but they do have a grandfather. Worker bees live for up to five months during the winter, but in summer they are only around for six weeks. To get through the winter, the worker bees all huddle together with the queen in the middle to keep her toasty even when the hive is surrounded by snow. A single worker bee will contribute 1/12th of a tablespoon of honey in their entire life. Your children will also get a kick at having thousands of tiny pets all at once! What might start as 10,000 bees in the spring can soon expand to 60,000 in the summer, as the queen easily lays 2,000 eggs in a day. Realistically speaking, you won’t rake in millions in beekeeping, but selling honey is still a good source of income. It is important to note however, that you shouldn’t expect lashings of honey within a few weeks after you’ve installed a hive. It will be best to let the bees keep their honey for the first year that you’ve raised them, especially since they’ll be needing honey for energy and nourishment in the winter months. Lastly, honey has health benefits besides being our favorite sweetener. It contains flavonoids and antioxidants, which may help reduce the risk of cancer and heart disease. Honey is also anti-bacterial and anti-fungal, and is widely known to soothe sore throat. Follow more news on honey bees at Bees.news.